Among the major announcements at this week’s launch of the 2013 North American International Auto Show in Detroit was the North American Truck of the Year with the heavily decorated 2013 Ram 1500 taking the top honors for the truck and utility vehicle segment – joining the Cadillac ATS in an all-American sweep of what is arguably the biggest award issued each year in the US market. Back in October 2012, the North American Car and Truck of the Year jury announced their short lists for the 2013 awards and included in that list were ten vehicles in the truck/utility vehicle segment with the 2013 Ram 1500 being the only actual truck on the list. Joining the Ram were seven sport utility vehicles of varying sizes including the Acura RDX, the BMW X1, the new Ford Escape, the Hyundai Santa Fe, the Infiniti JX35, the Mazda CX-5 and the Nissan Pathfinder. The Truck and Utility class also included two vehicles that would seem to make more sense in the car category as the Audi Allroad and Ford C-Max are far more cars than they are utility vehicles. However, the North American Car and Truck of the Year award has been questioned in the past for including certain models in what seems to be the wrong category but the same can be said about most of the major automotive awards. After the short list of 10 vehicles was established in October, the jury then took to establishing the three finalists from each class and from the Truck and Utility Group – the 2013 Ram 1500 was joined by the Ford C-Max and the Mazda CX-5 in the final voting. This looked like a tough class as the Mazda CX-5 is a great, super efficient sport utility vehicle while the Ford C-Max is a great compact hybrid that offers some of the best fuel economy figures in the US market for a vehicle that offers this level of cargo and passenger space. After an intense period of scrutinizing over these three vehicles, the NACOTY jury picked the 2013 Ram 1500 the best truck in North America for the 2013 model year. The big win for the 2013 Ram 1500 doesn’t come as a huge surprise even with the air tight competition from Mazda and Ford when you consider the fact that the 2013 half ton Ram pickup has claimed pretty much every truck and utility vehicle award handed out over the past few months. 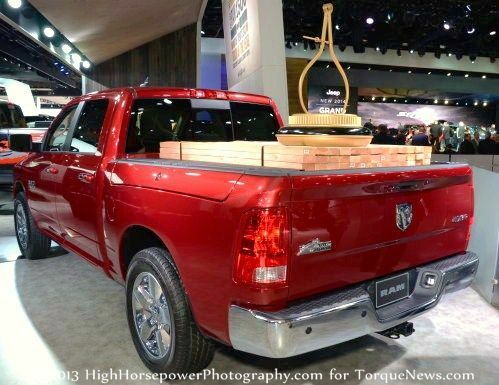 While awards like this are often more about politics than which is the best vehicle in the category, the 2013 Ram 1500 is a truck that is deserving of the “Truck of the Year” title. The Chrysler Group has done an amazing job of packing the new Ram with gadgets that make it more capable yet more efficient and while these features arent going to allow the Ram to overtake the F150 or the Silverado in terms of annual sales, all of these attributes due to all of the new features could very well help the half ton Ram close the gap on the cross town rivals. This is the second time that a Ram 1500 has won the North American Truck of the Year trophy – having taken the title in the inaugural year of the award in 1994. The 2013 Cadillac ATS claimed the title of 2013 North American Car of the Year and you can read more about that by clicking here!